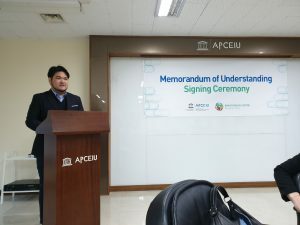 On February 18th, 2019, the Ban Ki-moon Centre for Global Citizens and its partner UNESCO APCEIU had an official MOU signing ceremony at the APCEIU office in Seoul, South Korea. 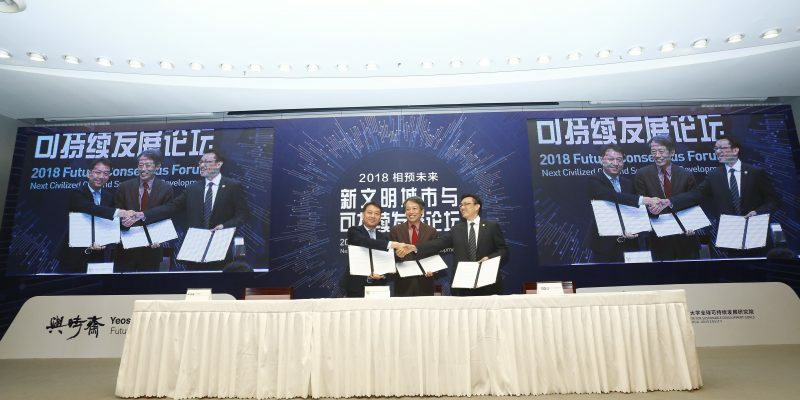 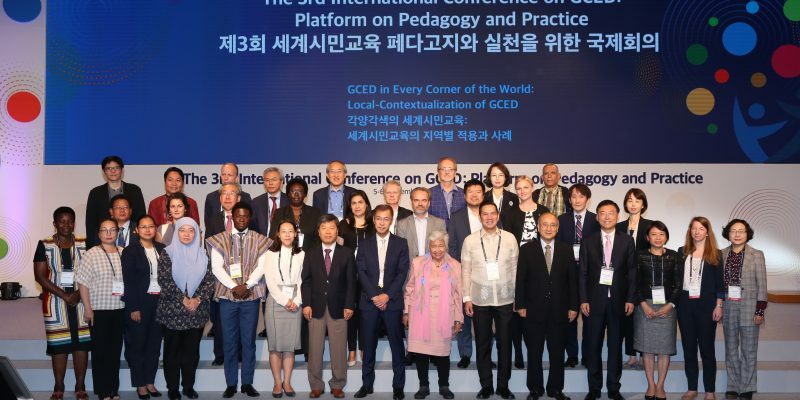 The two organizations electronically signed the MOU on October 19th, 2018 and have collaborated on promoting Global Citizenship Education (GCED), organizing experts’ meeting on education, and developing online courses on the Sustainable Development Goals (SDGs) and women’s empowerment. 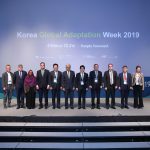 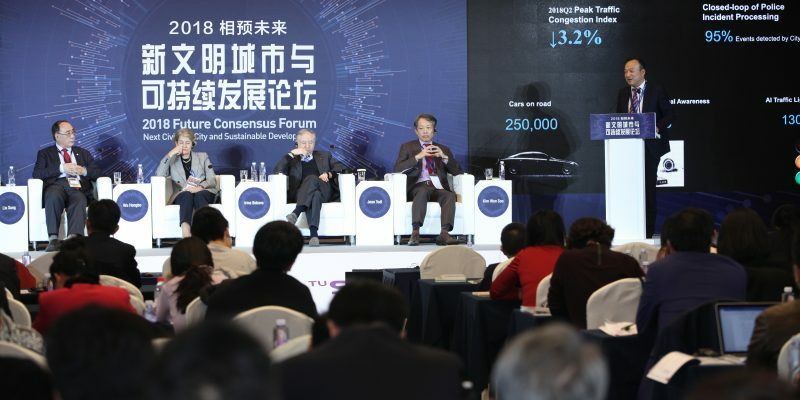 BKMC CEO Monika Froehler has also moderated a plenary session of the 3rd International Conference on GCED hosted by the APCEIU in Seoul in September 2018. 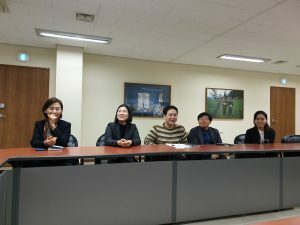 The MOU was signed by BKMC CEO Monika Froehler and APCEIU Director Chung Utak in order to work together on further promoting the notion of global citizenship and fostering many collaborative activities, including organizing meaningful workshops and conferences on GCED. 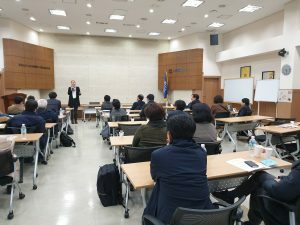 Upon the visit to the APCEIU office, the Centre also had an opportunity to introduce its work and mission to the professors of Kyung-Hee University, who were having a meeting to discuss implementing global citizenship courses as mandatory courses for all students at the university to take starting from this spring semester. 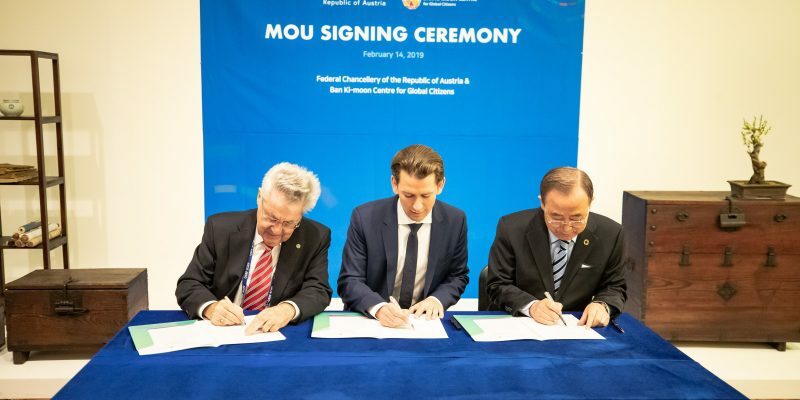 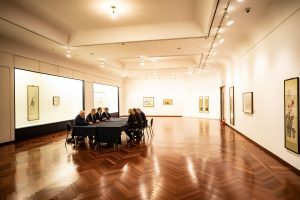 On February 14th, 2019, the Ban Ki-moon Centre for Global Citizens and the Austrian Chancellery signed an Memorandum of Understanding in Seoul, South Korea on the margins of the Global Engagement and Empowerment Forum 2019. 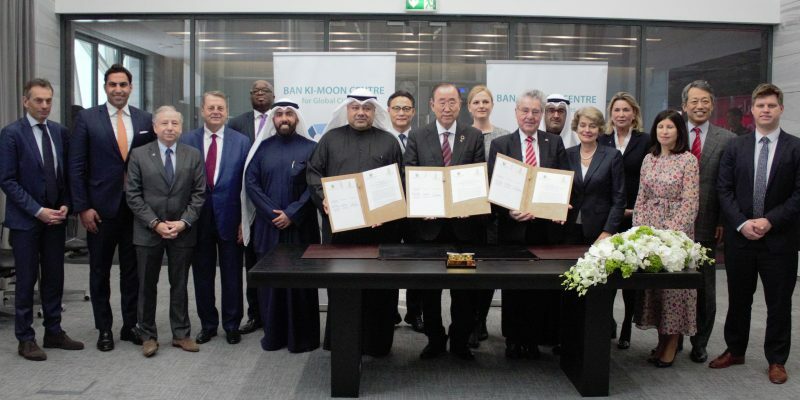 The MOU Signing ceremony was followed by a bilateral meeting between BKMC Co-chairs Ban Ki-moon and Heinz Fischer and CEO Monika Froehler, and the Austrian delegation from the chancellery. 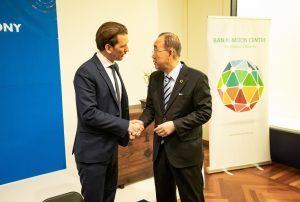 As the youngest head of government in the world, Chancellor Kurz resembles the important role that youth leadership plays to ensure a sustainable future of our planet. 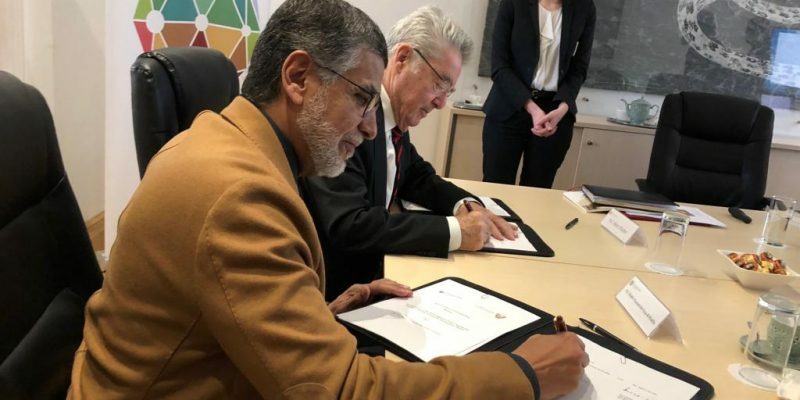 As the Centre received fund from the chancellery this year to pursue projects for youth fellowship, this gave the opportunity for the two partners to sign the MOU to work towards the implementation of the SDGs by empowering young leaders. 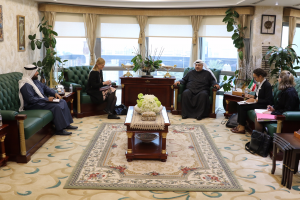 On February 11th in Kuwait, BKMC Co-chairs Ban Ki-moon and Heinz Fischer signed an MOU with Dr. Khaled Mahdi, Secretary General of the General Secretariat of the Supreme Council for Planning and Development of the State of Kuwait. 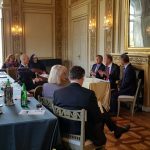 The two partners aim to empower women in GCC region by developing fellowship programs and more. 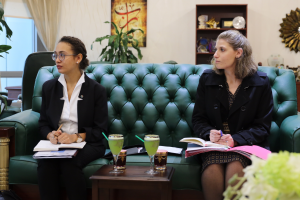 To further discuss the projects and potential areas of collaboration, BKMC CEO Monika Froehler and Associates Julia Zimmerman and Viola Christian had a meeting with Dr. Khaled Mahdi at the Secretariat. 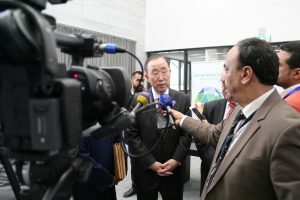 The Ban Ki-moon Centre for Global Citizens (BKMC for GC) and its affiliated offices, the Ban Ki-moon Center for Sustainable Development (BKMC for SD) in Seoul, Korea and the Ban Ki-moon Institute for Sustainable Development (BKMI for SD) in Almaty, Kazakhstan, signed Memorandum of Understanding (MoU) during European Forum Alpbach on Sunday, August 26, 2018. 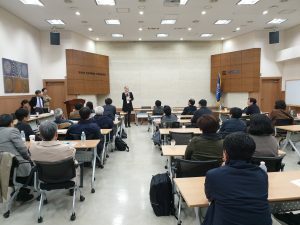 The BKMC for SD was established under the Institute for Global Engagement & Empowerment (IGEE) at Yonsei University in September 2017, and the BKMI for SD was established at Al-Farabi Kazakh National University in May 2018. 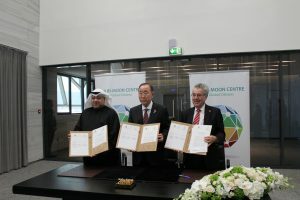 At the signing ceremony, the pre-signed MoU by Executive Director Sohn Myeongsei of IGEE was signed by Co-chairs Ban Ki-moon and Heinz Fischer of the BKMC for GC and Rector Galym Mutanov of the BKMC for SD. 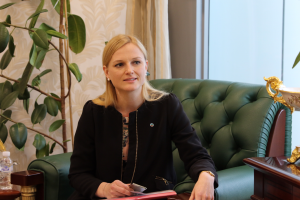 The three parties in different countries will strengthen their partnership to cooperate on empowering youth and women through education and other areas to effectively implement the SDGs worldwide. 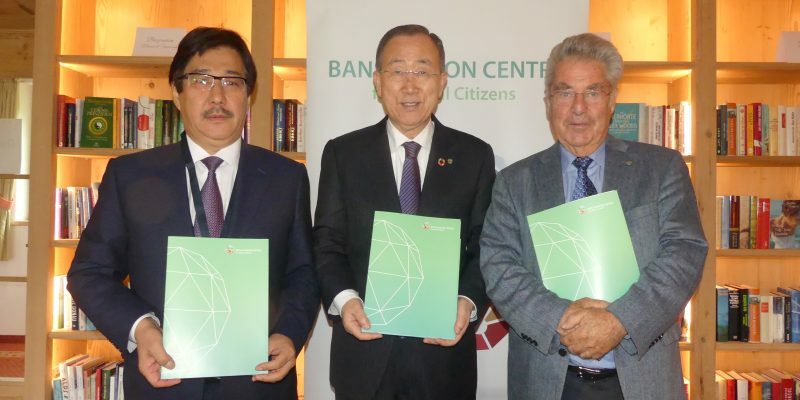 During European Forum Alpbach 2018, the Ban Ki-moon Centre for Global Citizens (BKMC) and the International Anti-Corruption Academy (IACA) signed Memorandum of Understanding (MoU) on Sunday, August 26, 2018. 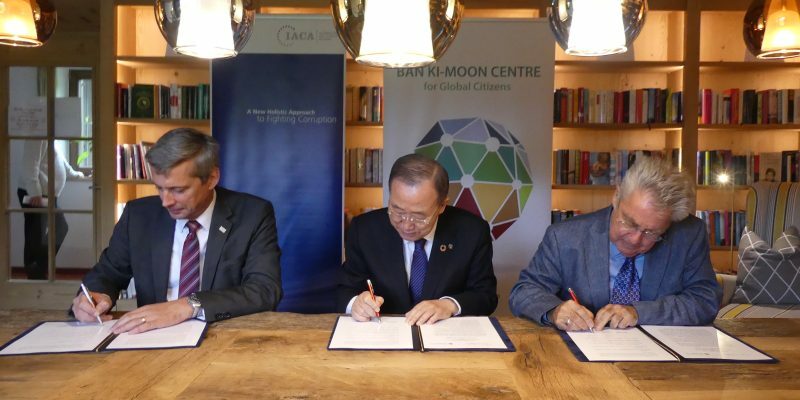 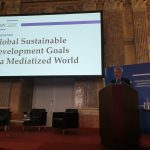 The MoU was signed by BKMC Co-chairs Ban Ki-moon and Heinz Fischer and Martin Kreutner, Dean and Executive Secretary of IACA. 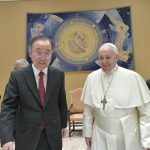 Upon the agreement, both parties will cooperate to provide a framework to fight against corruption and work together for empowering women and youth towards the fulfillment of the Sustainable Development Goals (SDGs).